Robyns Simple Life: Finally Did it! Yep, I finally did it.. 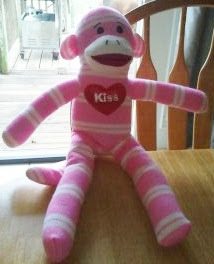 I bought myself a ...... SOCK MONKEY!.. I know, nothing Earth shattering but, I've wanted a sock monkey for so long and I know this one isn't all that nice but he was on sale at Rite Aid for like $3.00 and change so I took him home.. There is a woman I know who lives in my town who makes really nice ones but I haven't had the courage to ask her to make me one.. I've seen some nice ones on Etsy and Ebay so when money allows I'll purchase some nice ones. I know some people don't like Sock Monkeys, like Mr L.. He had one when he was a not so innocent child of 13 or 14 and he hated it so, he ripped it's ears off and set the rest of him on fire.. I fully warned Mr L. to leave my sock monkeys alone!..They remind me of my childhood. My brother had one and I walked around with it all the time.. Thanks so much for stopping by.. I thought he was OK looking but I've wanted one for so long and it was so cheap I had to snap him up.. LOL.. Thanks for the follow.. Yes I know those Captcha things are horrible.. especially for people like me whose eyes don't see as well as they used too.. LOL!. I love it. My daughter who cannot sew watched a youtube video and made one. I have never made one but now I am inspired!